A quirky combination of East meets South-of-the-border flavours, complete with an authentic homemade Mexican soft corn tortilla. Gluten and dairy free. 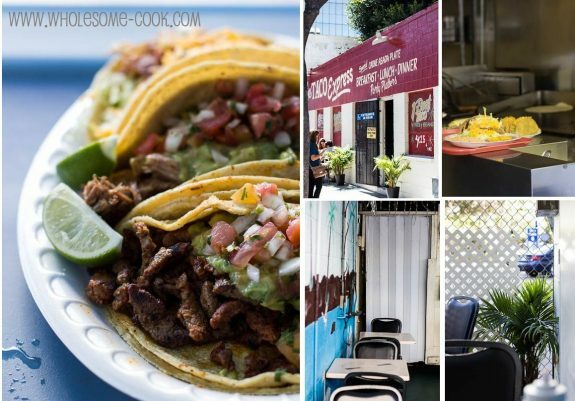 With an Urbanspoon score of 97, San Diego’s Taco Express is an icon of sorts and a local favourite. When I worked out they were located only a couple of blocks away from the W hotel we were staying at during our recent trip to SD, not going was not an option. I settled on a trio of Fish, and the more traditional Carnitas (pulled pork) and Pork El Pastor (spicy pork) tacos from the surprisingly extensive menu. 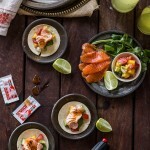 Infatuated by the flavours of the fish taco served in a soft homemade corn tortilla, I decided to brainstorm a few simple taco ideas to try at home. Tell me, have you ever tried recreating a restaurant dish at home? Have you tried fish tacos before? 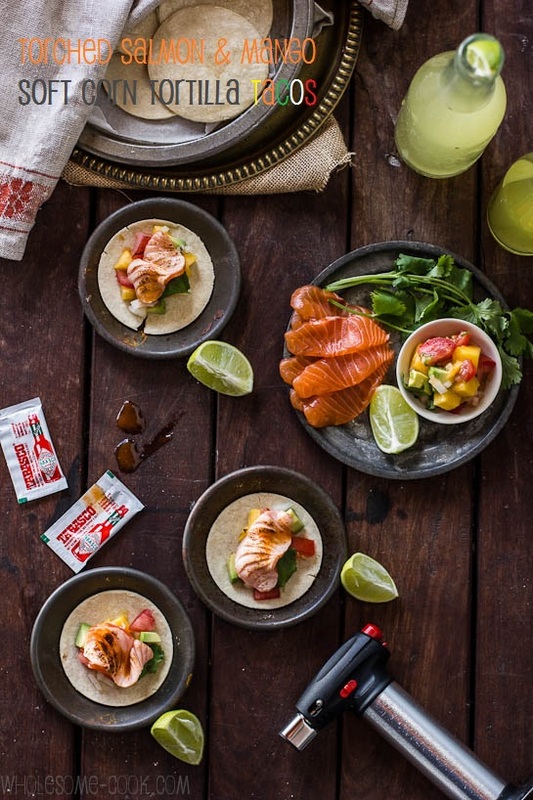 Since I am always craving Asian flavours, and mangoes have come into season, an East-meets-Mexican tacos made with sashimi-grade salmon were born. Treated with a little blowtorch action, which gives the fish a smoky flavour while the texture is exactly as the fish is cooked; part grilled, part silky smooth, chewy and raw. The flavours that mingle in this mini version are nothing to write home about on their own, but when put together they do pack a punch. 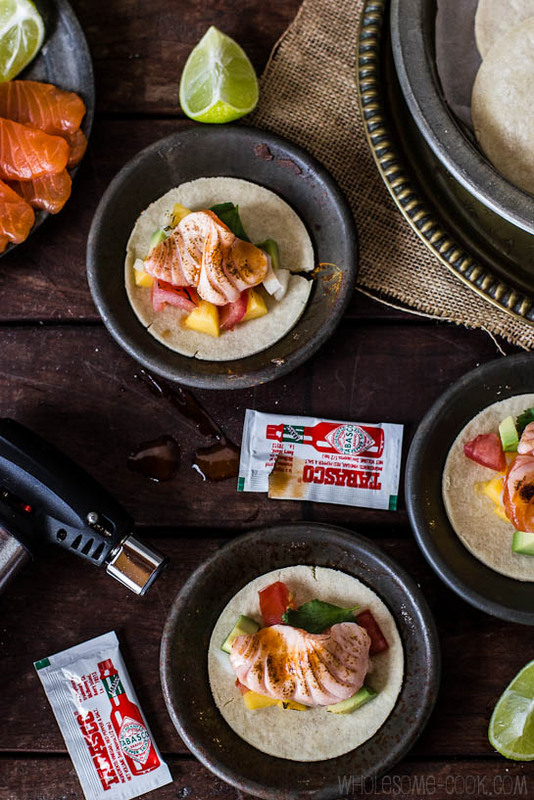 Salsa fresca (also known as pico de gallo) is sweetened up with some fresh mango chucks and spiced with sriracha – both quite Asian in origins, while the fish is treated to a firey dash of tabasco. Last but not least, because this is important in a good taco, is the tortilla. I wanted to make the tortillas from scratch, which would ensure a more authentic Mexican experience and of course mean they were gluten and preservative free. Soft Corn Tortillas require Masa Harina, which is a Mexican-style corn or maize flour for making tortillas. I picked my New Zealand produced Masa Harina from a new super-funky and well-stocked South American deli Salt Meats Cheese within the Grounds of Alexandria. 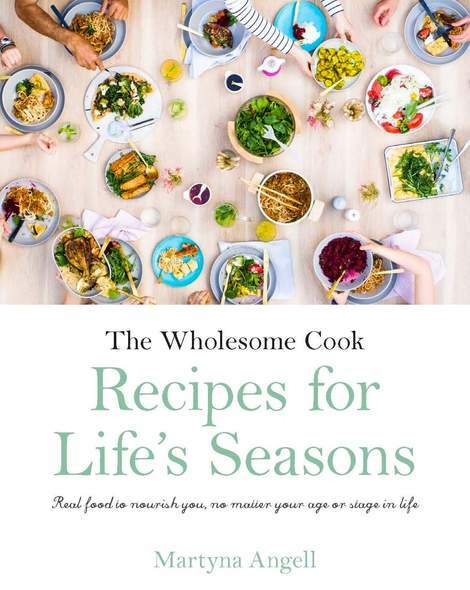 You can also try the Essential Ingredient or a local Mexican community restaurant or deli. Incidentally, I found the simple 3 ingredient tortilla recipe in the March 2011 issue of Gourmet Traveller, complete with a masterclass on how to best make them on page 52. Since I don’t have a tortilla press, I used two flat-bottomed plates to press my rounds and it worked a treat, as did… Donna Hay’s Royal Doulton mini cake stand. A rolling pin is also a good option once you’ve flattened the rounds, but be mindful to work your way right around the dough otherwise the edges will crack. 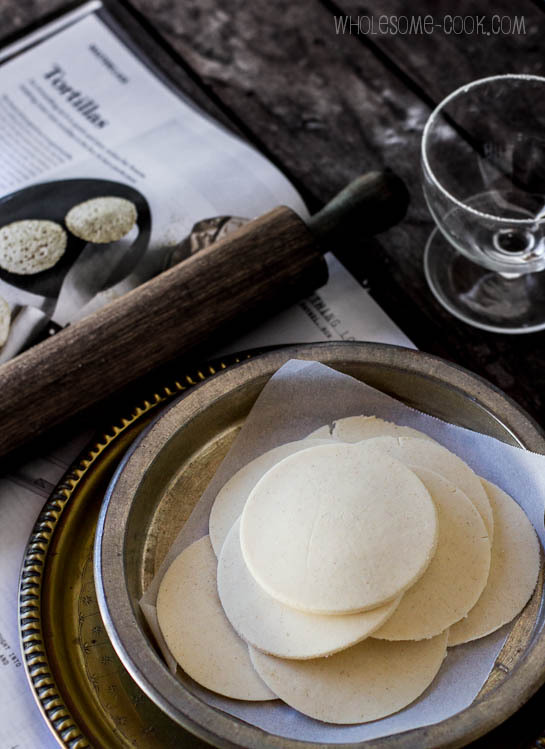 Although I don’t mind them rustic like this, you could use a large glass to cut out your perfectly round tortillas, sized for a couple of bites. For a Vegan taco version, you could use deep fried tofu or cooked broadbeans (fava beans), sans torching. 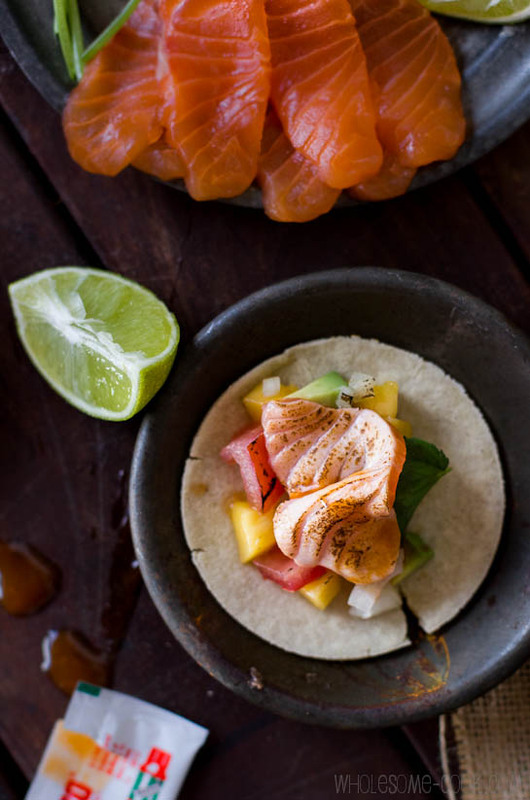 Sashimi-grade salmon and masa harina, Mexican tortilla flour are a must in this recipe. To press your tortillas you could buy a special tortilla press or use two plates or a rolling pin to shape them instead. You will need a kitchen blow torch (great for brûlée as well). Tortilla recipe adapted from Gourmet Traveller Tortilla Masterclass, March 2011 p.52. Makes about 10 servings. Place flour in a bowl, add a pinch of salt and add water. Mix together for a couple of minutes until the dough forms a soft, pliable ball. Wrap the dough tightly with cling film and rest for 20 minutes. When ready, divide dough into 8 and roll into balls. 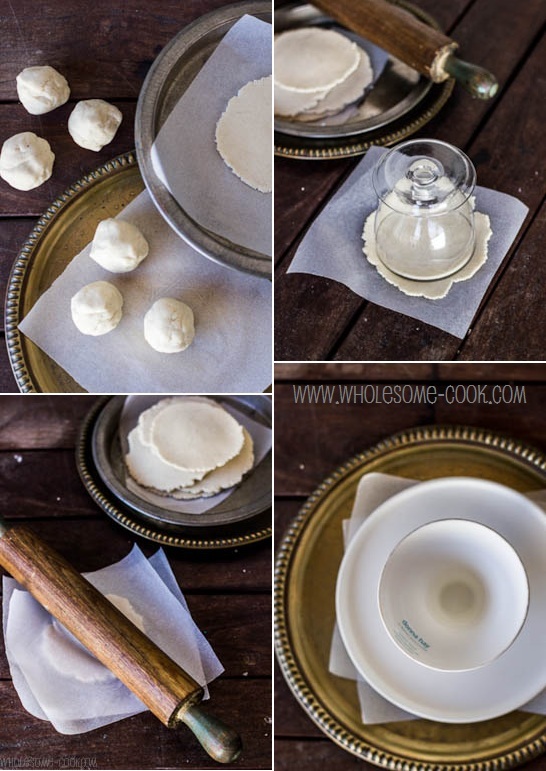 Place each ball inbetween 2 small sheets of baking paper and roll out, or press inbetween two flat plates until only about 3mm thick. For a perfect circle, use a large glass to cut out the circles and re-roll scraps to make 2 more tortillas. Heat a large pan over medium high heat and slide in tortilla rounds. Cook for 30 seconds on each side. Transfer cooked tortillas into a basket or plate lined with a kitchen towel and wrap up to steam and soften for a few minutes before serving. Combine diced mango, tomatoes, avocado, onion and diced coriander stalks in a bowl. Add Sriracha and lime juice and mix well. Arrange salmon sashimi slices and lime wedges on another plate. Serve soft tortilla rounds with a spoonful of mango salsa. Top with a coriander leaf and a salmon sashimi slice. Blowtorch fish until lightly charred. Drizzle with a dash of tabasco and serve with extra lime wedges on the side. Oh my deliciousness! I’ve never had a fish taco before in my life but as a sushi lover this might have to be my first, Great photos! I am often inspired by things I eat out but I lack the skills and tastebuds to cook it at home. This is why I visit your blog, didn’t you know???!!! LOLs at your inventiveness for pressing the tortillias. Donna would be proud. I have been such a fail at corn tortillas. I’ve tried several times and they seem really thick. I have a tortilla press and cooker and if I’m not careful they explode. I need lessons or make time to practice. 🙂 It all looks great. I went to gourmetraveller and wouldn’t you know their site is down? 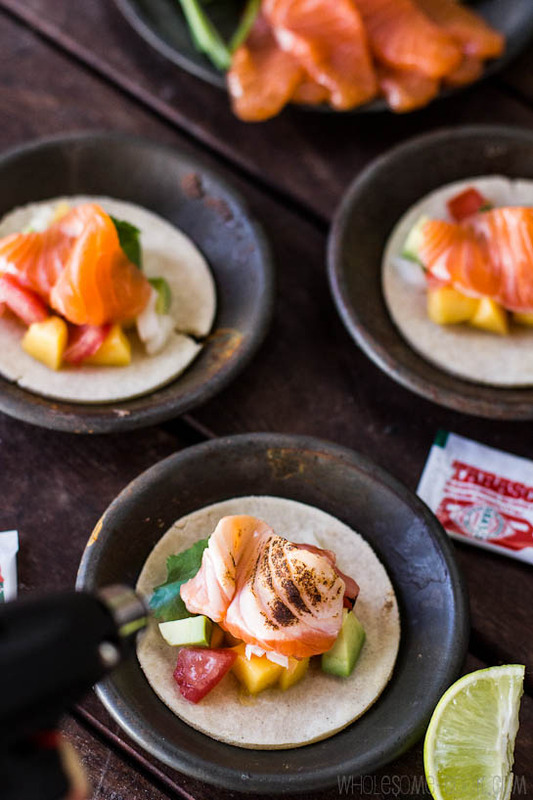 I love fish tacos and this is a really cool idea for making something completely different! And homemade tortillas, awesome!! Scrumptious! Those tortillas are perfect and I really like your choice of filling. Delicious! Salmon and mango are one of my favorite combinations. I like how you put sweet chili sauce in the dish. Great job on the tortillas! Corn tortillas are hard to make without a tortilla press. These look absolutely fantastic! My brother and I were just talking about making tortilla last night, so I would love to give these a go. I have fish taco in Hawaii, but the fish was horribly over cooked. I can’t wait to try these! This is really impressive, Martyna. Your tacos look so perfect and neat, as if you had been making them all your life. I have never tried tacos with fish, but they look fabulous. In general I have a very vague idea of the Mexican cuisine (I know maybe five dishes and cook two), so I’m glad to learn more about it from you.